U.S. military leaders have submitted a proposal to the Obama White House that would leave behind a 10,000-strong military force in Afghanistan after 2014 when the combat mission ends. The Wall Street Journal first reported the plan, and Fox News confirmed it. 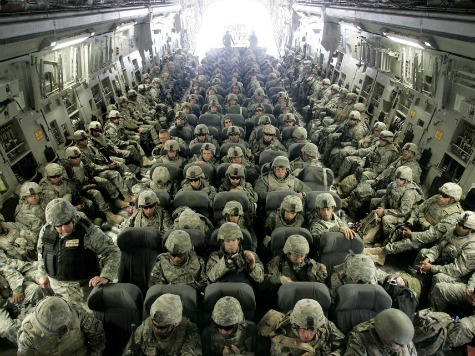 Under the plan, which has the backing of the U.S. State Department and intelligence agencies, American military presence in Afghanistan will be brought down to almost zero by the end of Obama’s term. The WSJ reported that U.S. Gen. Joseph Dunford, the top commander of U.S./NATO-led forces in Afghanistan, told the White House last week that the U.S. should leave behind a residual force of 10,000 troops or withdraw all of them. U.S. military leaders said the Pentagon needs those 10,000 soldiers to secure the bases and keep personnel safe while they continue to work in Afghanistan, according to WSJ. A bilateral security agreement between Kabul and Washington that will pave the way for U.S. military presence in Afghanistan after 2014 is still pending. This can prevent the 10,000-troop plan from coming to fruition. Afghanistan President Hamid Karzai has refused to sign the security plan. Obama’s White House has warned that if Karzai does not sign the agreement, the U.S. will be forced to start planning for complete withdrawal of American forces from Afghanistan.